Some coincidences are just too strong to ignore. 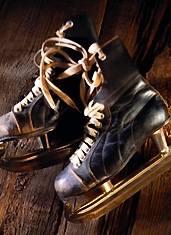 Like when a pair of hotels debuts a pair of ice-skating rinks. At the exact same time. Thus, we were compelled to investigate Skating in the Sky at the W Downtown and The Standard Ice Skating Rink. By no means should you consider this a competition. Though someone will skate away with a humongous trophy. The W: 400 square feet. The Standard: 3,000 square feet. Edge: The Standard. But the 12-by-40-foot rink at the W is still enough space for your Black Swan interpretive Ice Capades show. The W: Five floors up. Edge: The W. The Russian judge/cocktail waitress will appreciate the extra degree of difficulty. The W: A futuristic hybrid-ice synthetic rink panel polymer. Edge: The Standard. There may or may not be a Zamboni. And we may or may not know where the keys are hidden. The W: Panoramic views. Titans of the financial world working on their short program. The Standard: Waitresses in tight black snowsuits. Models/skaters in tighter black jeans. Edge: The Standard. Imagine the rink at Rockefeller Center, but with fewer families from Tulsa, and more visiting European dignitaries. The W: Skate-up, rinkside Ice Bar constructed entirely out of freezing-cold blocks of fake ice. The Standard: Biergarten with Winter Oyster Bar. Cheese fondue. Edge: The W. It’s hard not to appreciate a winterized version of the swim-up pool bar. The W: Kumquat Mules. Bourbon Hot Toddies. The Standard: Hard pear cider. Bitburger Pils. Schnapps. Edge: The Standard. Martini glasses and slippery synthetic rink panel polymer make terrible bedfellows.